Heat oven to 450°F. Spray large rimmed cookie sheet with cooking spray. In 12-inch skillet, heat oil over medium-high heat. Add bread crumbs; cook 4 to 5 minutes, stirring frequently, until golden brown. Transfer to shallow bowl. Between 2 pieces of plastic wrap, place each chicken breast; gently pound with flat side of meat mallet or rolling pin until about 1/4 inch thick. Season chicken breasts with 1 teaspoon of the salt and 1/2 teaspoon of the pepper. In shallow pan, stir together flour, remaining 1/4 teaspoon salt and 1/4 teaspoon pepper. In shallow bowl, mix eggs and water with whisk. Coat both sides of chicken with flour mixture. Dip chicken into beaten eggs; turn to coat. Dredge in browned bread crumbs, coating completely. If there are any bread crumbs left in bowl, pat them on top of chicken breasts to cover any bare spots. Place chicken breasts on cookie sheet. Bake 13 to 15 minutes or until juice of chicken is clear when center of thickest part is cut (at least 165°F). 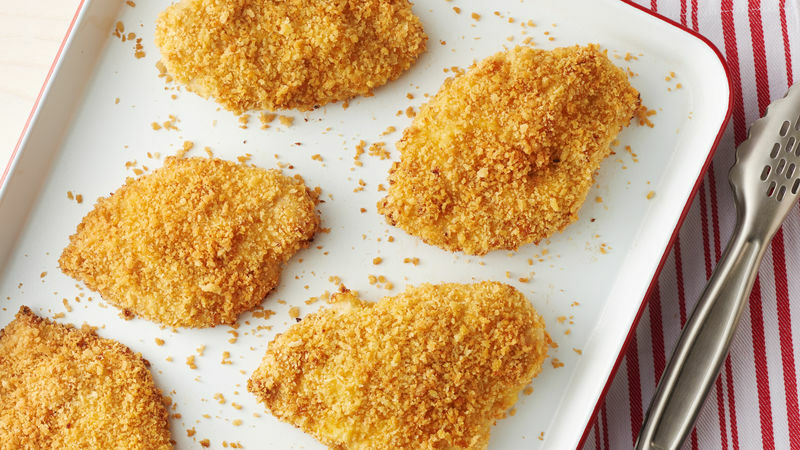 To freeze: Arrange unbaked breaded chicken breasts on two large cookie sheets. Cover loosely with plastic wrap; freeze 3 to 4 hours or until frozen solid. Wrap each breast in plastic wrap, and store together in 2-quart freezer bag up to 1 month. To bake: Heat oven to 450°F. Place desired number of frozen breaded chicken breasts in 1 layer on cookie sheet. Bake 20 minutes. Turn over; bake 8 to 10 minutes or until juice of chicken is clear when center of thickest part is cut (at least 165°F). Chicken breasts come in varying sizes, even within the same package. Cut any extra-large breasts in half. This would then count as two. Browning the bread crumbs before using them to bread the chicken makes them extra crispy and ensures even browning.